That's Judy in the pink! 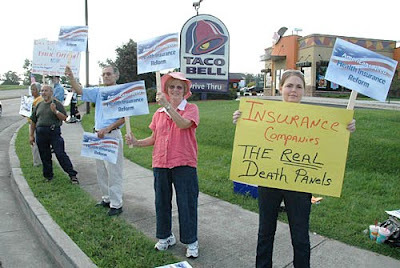 Wendell Potter — nationally renowned whistle-blower about health insurance industry practices — titled his new book “Deadly Spin.” He describes how the industry manipulated the debate in the failed health care reform effort during the Clinton administration and again last year when the issue was put forward by the Democrats. The book is an excellent refresher course on basic propaganda/ PR ploys. Paid well into six figures, Wendell Potter earned his money. Conscience ultimately made him resign, but the courageous choice to actively become a whistle-blower was in part prompted when he heard the spin he himself had crafted years earlier coming from the mouth of then Congressman Zach Wamp during the latest debate. It was Potter and his associates who formulated the propaganda from the health care industry: “Socialism,” “government-run,” “redistribution of wealth,” “handouts to irresponsible bums,” “going naked,” “the best health care in the world,” “health care for illegal immigrants” — all misleading, deliberately provocative and fear-inducing. Sadly, the Republican Party, not just fringe extremists, latched onto this reprehensible spin and spun it to block reform years ago, in the latest effort, and still yet as it revs up to try to knock down the important work of the last two years. The power of spin is evident. How else were we so easily distracted from the fact that the way we do health care will bankrupt our nation, and soon, and that fully one-sixth of us either can’t afford health insurance or are shut out because we are or have been sick? This is about real people and real suffering, not clever words to make the already rich, richer. And Jennie Young's letter was printed today! It's the same one (I think) that was in the Star earlier.